Twenty years ago, in February of 1996, Little, Brown and Company published David Foster Wallace’s (1962–2008) novel Infinite Jest. It was a bold undertaking for the firm to publish a complex, challenging novel that spans over 1,000 pages and contains hundreds of endnotes, many quite lengthy and all printed in very small type. The sheer size of the book required that it be sold for $30, an unorthodox price for any novel, let alone a second novel by a young, up-and-coming author. Wallace began seriously writing Infinite Jest in 1991. The publication of the book took years of hard work not only from Wallace but from his agent Bonnie Nadell, his editor Michael Pietsch, and others who read and supported the book’s development in one way or another. 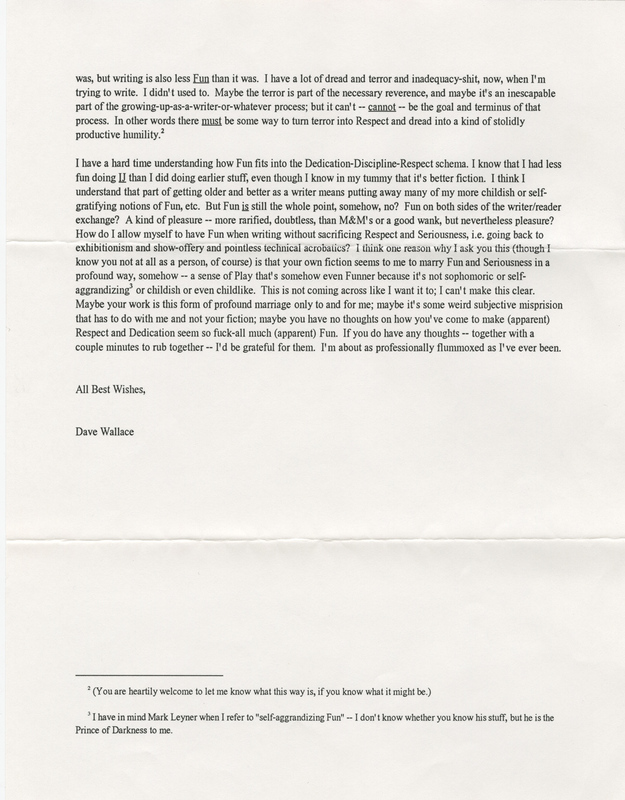 Evidence of this hard work can be found throughout David Foster Wallace’s archive and in other related collections at the Harry Ransom Center. David Foster Wallace (1962-2008). 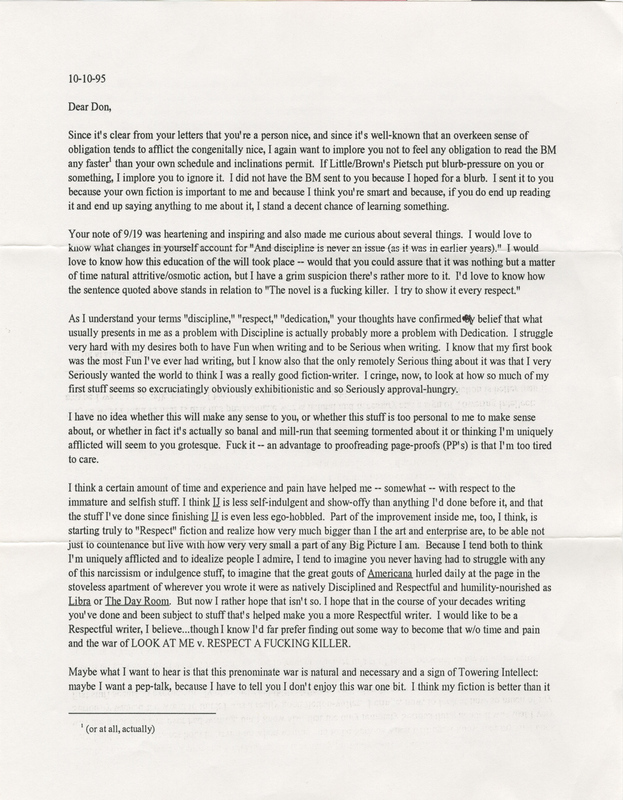 Letter to Don DeLillo, dated October 10, 1995. 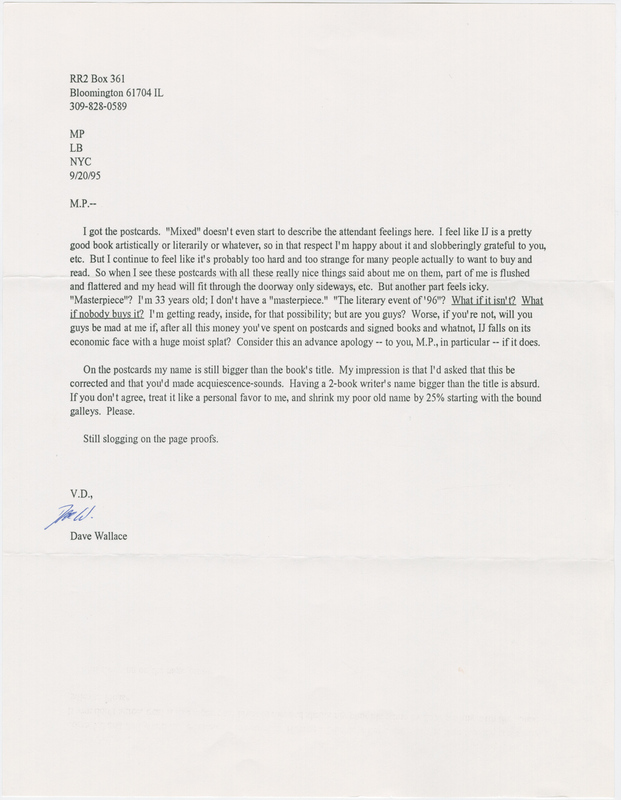 © David Foster Wallace Literary Trust. David Foster Wallace (1962-2008). Letter to his editor, Michael Pietsch, dated Sept. 20, 1995. © David Foster Wallace Literary Trust. These items—and countless others in the papers of David Foster Wallace, Don DeLillo, Little, Brown and Company, and Bonnie Nadell, all housed at the Ransom Center—offer some sense of the struggles and the great joy that surrounded the writing, editing, and publication of one of the most defining books of the twentieth century. To commemorate the twentieth anniversary of Infinite Jest, Little, Brown and Company is publishing a new edition of the novel on February 23, featuring a cover designed by a fan and selected by the publisher through an open contest. Read more in our series commemorating the twentieth anniversary of the publication of David Foster Wallace’s Infinite Jest. Wallace’s papers are held in the Ransom Center’s collections.